This is about the tragic maritime accident in the Atlantic Ocean during the early 20th Century summarised by Hourly History. The wreckage of Titanic was long shrouded in mystery and till date, there is no conclusive evidence as to why it happened as, during the past, several other ships have survived ice berg accidents. However, despite there being so many similar maritime accidents in history, this was made popular by the Oscar winning movie of James Cameron. The book starts with the building of Titanic by the White Star Line company who wished to build the best luxury ships ever created; including the third class deck, which was better than the standard third class decks of the other ships of its time. 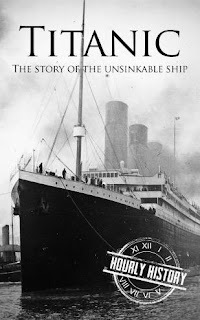 The book then goes on to dispel the myths about the Titanic being; the White Star Line company never claimed it to be unsinkable and that it was more of a public perception and also the fact that the ship did have life boats enough to satisfy the government regulations back then. The book then goes on describing the famous personalities on board the ship and also, the eventual drowning, deaths and the rescue operation and with a conclusion on how though this event was tragic, it led to development of a lot of more stringent maritime safety regulations reducing the number of accidents. I liked the fact that the book dispelled myths, considering, it is still widely believed that the company believed the ships to be unsinkable and thus, they didn't have sufficient life boats on board. Additionally, I also liked how the book described the various activities and pastimes in the ship. The book also commented on how this incident improved the future of maritime travel and also talked certain interesting personalities such as Margaret Brown who forced to redirect her lifeboat to save the people from the location of the debris. While this was hardly the fault of the book, I felt too many personalities were introduced; and beyond a point, I started losing track since there was so much details about various business persons who travelled on board. On the whole, I felt this was a good read, especially considering the amount of myths that it dispelled. I would award the book a rating of seven.